Cane Bay Partners VI Co-Founders Kirk Chewning and David Johnson on Thursday congratulated the University of the Virgin Islands on the historic groundbreaking of the university’s planned Medical School and pledged their continued support for the initiative. Cane Bay Partners VI announced that it is stepping up its support for the overall project and will be committing to an annual contribution of $2,500. The company gave an initial $2,500 to the school in 2014. “We are proud to support the development of UVI’s medical school. This project hopes to expand educational opportunities in the Virgin Islands, while supporting our health care infrastructure, both meaningful objectives that we stand behind,” Cane Bay Partners Co-Founder Kirk Chewning said. 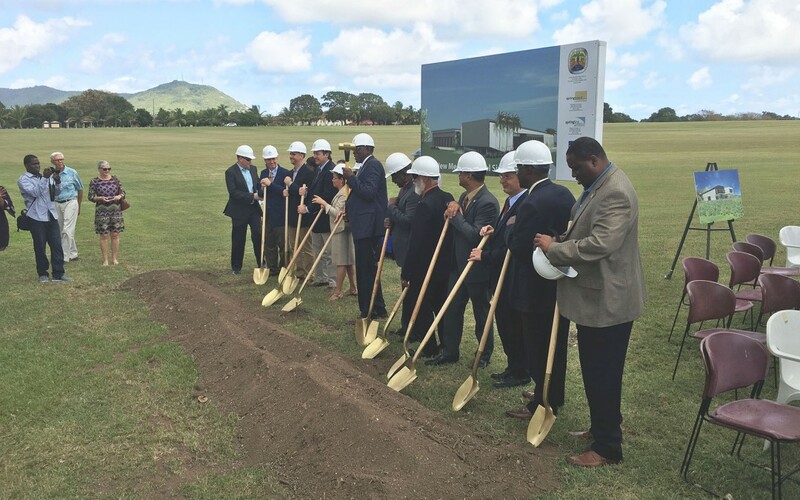 The groundbreaking Thursday marked the start of construction on the planned one-story, 21,332 square foot Medical School Simulation Center on St. Croix. The university held a similar groundbreaking Wednesday on St. Thomas for the planned two-story, 33,876 square foot Medical School Classroom Building on St. Thomas campus, according to UVI. “UVI is such a critical institution in the Virgin Islands and we are happy to support their expansion efforts. This medical school has so much potential for the territory and its residents and we will continue to do all we can to help it become a reality,” Cane Bay Partners Co-Founder David Johnson said. The plan university hopes to begin producing teams of well-trained health care professionals, establishing clinical sites throughout the territory, address anticipated shortages of the nation’s and territory’s physician workforce, and enhance the quality of care in the Virgin Islands, according to UVI. “Dave and Kirk have been doing great work supporting non-profits within our community. They have been steadfast in their commitment to working with the university to expand our applied mathematics as well as analytics offerings. This gift, in support of the UVI School of Medicine, helps to strengthen our LCME application for accreditation. We encourage more companies and individuals within our community to join Cane Bay Partners in making a substantive investment in UVI,” UVI Vice President for Institutional Advancement Mitchell Neaves said. Cane Bay Partners VI has been a supporter of UVI since the company was founded in 2009. Cane Bay Partners VI has donated more than $70,000 since 2009 to build out UVI’s Business Computational Science and Modeling Curriculum. Through that program, Cane Bay Partners VI has hosted seven interns from the university, three of whom have been hired after completing their degree. The company recently expanded its support and donated to the university’s Park Service Tracking Project. Cane Bay Partners VI and its executives support a number of health care initiatives as well as educational initiatives. Cane Bay Partners Co-Founder David Johnson last month made a major donation to the Gov. Juan F. Luis Hospital on St. Croix, and Co-Founder Kirk Chewning supported a golf tournament to raise funds for Junior Achievement Virgin Islands. UVI President Dr. David Hall talks during university’s planned Medical School groundbreaking. VI Senate President Neville James talks during UVI’s planned Medical School groundbreaking. UVI and VI government officials during the Medical School groundbreaking Thursday.